Rinse the okra pods and pat them dry. Cut off the two ends and slice the pods into rounds 1/4 inch (5 centimeters) thick. You can cut 2 or 3 pods at the same time. Put the slices in a mixing bowl and sprinkle over them the ground coriander, turmeric, cayenne pepper, and salt. Toss the slices to coat them evenly with the spices. 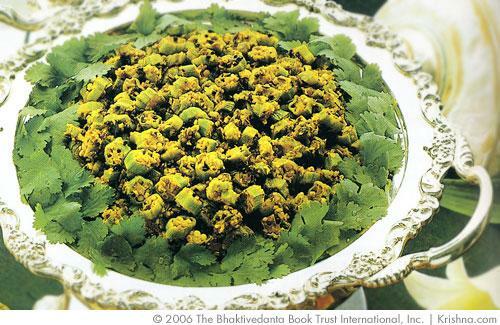 Heat the ghee or vegetable oil in a frying pan, karhai, or wok and drop in the cumin seeds and black mustard seeds. Cover the pan for a moment to prevent the mustard seeds from popping out. Then toss in the asafetida. Fry for a few seconds, and then add as many of the seasoned okra slices as will fit in one layer. You will probably have to fry them in 2 or 3 batches. You should have an idea of how many batches it will take before you start cooking, so that you can divide the ingredients accordingly. Stir-fry each batch for 3 to 4 minutes until the pods appear to wilt and brown. For each batch, add a portion of the grated coconut and a portion of the sugar. Keep frying and stirring until the pods turn a reddish-brown and are very tender. Sprinkle the lemon juice over them and serve them hot.